This entry was posted in Professional and tagged Classroom, iPad, Scratch, wwwd on 3 January, 2019 by john. This entry was posted in Professional and tagged Kahoot, Microbit, MIEExpert, Minecraft, Mini Game Jam, Primary Computng, Scratch on 29 October, 2017 by amandaford78. This entry was posted in Professional and tagged Mini Game Jam, Primary Computng, Scratch, Voluntary work on 13 November, 2015 by amandawilson78. During May 2015 306 children from 22 schools across Glasgow participated in a series of Mini Game Jam events. The Mini Game Jam is an event for children who are in P6/7 & S1/2 and it involves schools within the same learning community getting their classes of P6 or 7 together and heading to the local secondary school to work with a class of S1 or S2 there to make a game using Scratch. The children are put into teams with children from the other schools in order to give a transition style event as well. While the main aim of the day is to create a game based on the theme given at the start of the day it’s about a little more than that. It’s about training teachers beforehand to give their classes scratch lessons so they are able to have an idea of how to create a game. It’s about giving the teachers confidence in their own abilities to teach games design/construction to their classes in school. It’s about encouraging children to work in teams and learn from each other. It’s about getting the schools in a learning community to undertake similar Computing work at the same time. It’s about showing children then can be the creators of their own games and not just consumers. It’s about letting children see there are careers available to them in the games industry (I am lucky enough to get volunteers to help and encourage the children on the day who are involved in games either as students/lecturers or who work for a games company). Most importantly it’s about the children having a FUN day while making new friends and being part of a team that’s created a cool game within the space of 3 or 4 hours. The first event kicked off in the Smithycroft learning community with 118 children from 5 schools taking part. This event was by far the biggest of all jams. Partially down to the fact that it’s been within the LC that I’ve been helping out and undertaking my research, and from their enthusiasm more schools have heard about it. The event was held at Smithycroft Secondary school and the children were put into their teams split over 5 rooms in the school. Once the theme was announced at the start of the day the children moved to their rooms and began planning their games. Which were to be based on Space. Some teams more enthusiastic than others to get started. However after 30 minutes all teams were talking to each other and working on their ideas. By lunchtime a lot of teams were finalising their games which left them time after lunch to test and refine their game. After lunch all teams quickly got back into putting those finishing touches to their games and worked hard on testing them out before we finally finished for the day. While the games were being judged the children were given a fantastic talk by Chihiro Yamada about how he got into the games industry and what he does now. 4 teams were selected to go through to the final and their games Team Groudon, Exodius, Asteroid Mayhem and JAZ. Next the Mini Jam headed to Rosshall Academy. The teams were split over 3 rooms though some rooms needed more encouragement than others to get chatting to each other however once they overcame their shyness the ideas started flowing. It’s great watching the ideas being brought to the screen and children realising they can make their games just like they thought. At the end of the day another fab presentation by Chihiro to the children while the games were judged. The winning games on the day were AAA and Space Run. The 3rd Jam was held at Holyrood Secondary with 2 classes being utilised for the teams who were participating. It’s the first time I had to give a room of children into trouble for NOT talking. However the children eventually got into it and were soon coming up with some brilliant ideas. Again by lunch time the children had the best part of their games done and it left them time after lunch to test their games and polish them up. The children were given a talk today by Alex Macolm and Sean Ward both students at Glasgow Caledonian University and they spoke of how they got into games and also of their experiences of the big Game Jam event which they have both participated in. The winners on the day were Team Pro 1 and Star Walker Voyager. Jam number 4 was run in conjunction with the Caledonian Club/NoPIlls Project from Glasgow Caledonian University. 50 children from Elmvale primary participated in a day of game making and getting the chance to visit the labs in the University where the NoPills Researchers work. It was a fun day for all involved. The very last jam was held at Bannerman High School. Every single school in the learning community had sent a team of children along. One of the purposes of the jam is for the children to meet with others within their learning community and this was a great example of all schools embracing that and taking part. Spread over 2 rooms the children once they eventually started talking to each other started to come up with their game ideas and before long they were onto the computers making these ideas a reality. We were left again with some tough decisions however in the end the games that got through to the final were Space Run and Light Bots game about space. Thanks to all schools who participated in the local events and to Smithycroft Secondary, Rosshall Academy, Holyrood Secondary, Bannerman High School and Glasgow Caledonian University for hosting these events. Big thanks also to those who helped me out on the days of the events: Kate Farrell, Chihiro Yamada, Sean Ward, Alex Malcolm and Stephen McArthur. This entry was posted in Professional and tagged Mini Game Jam, Scratch on 23 June, 2015 by amandawilson78. Do you wonder why it’s important to help pupils learn to code? The products of coding or computer programming are around us every day, whether we see it or not. Daily living in today’s society depends on someone somewhere having created something in which coding or programming has played a part. Many voices have spoken about how the society in which our pupils live requires more people now and in the future to be skilled in programming or coding. There is a fear expressed that schools which ignore teaching programming or coding are setting up pupils to only be consumers rather than creators of the code-driven products of today and the future. Many teachers of today, themselves unfamiliar with coding or programming from their own education, may be anxious that they don’t have the skills needed to teach pupils coding or programming. So this post sets out to collate resources which will support teachers to provide age-appropriate support for their pupils in including coding or programming in the context of different curriculare areas. Mitch Resnick, one of the main creators of the coding program called Scratch, delivered a TED Talk outlining the benefits of teaching childrens to code, so they can do more than just “read” new technologies — but also create them. Ginni Skalski has written a blog post of an interveiw with Red Hat product manager Burr Sutter (who works to make developers more successful and productive with open source tools, technologies, and techniques) who talks about why he believes children need to know how to solve technical problems, to know how to fix the tech tools they use every day, and how he balances that with other activities in which children participate. Watch the short video below to see a few creators of well-known online tools (from Facebook to Dropbox) explain briefly what they first did to get started in coding, and why it’s important we have more people learning to program. This is also described slightly more fully here. Also it is part of http://code.org/ The Hour of Code which links to quotes from a far wider range of well known or influential individuals on the importance of teachign coding today. Charlie Love has written on the Nesta site about why we should be finding ways to incorporate the teaching of coding into the curriculum, and highlights the links to SDcotland’s Curriculum for Excellence. 5 Reasons to Teach Kids to Code is a graphical poster created by @GrechenNoelle and @jonmattingly and presented by Kodable (a free programming tool and curriculum for the iPad) which sets out in a visually interesting way why it is important schools empower pupils to learn skills of programming. Dr. Patricia Fioriello sets out in a blog post why we should be Teaching Kids To Code to Prepare Them For The Future. The post lists 6 reasons, and describes them, and ends by advocating including teaching perogramming in the classroom. In a BBC Technology report “Where is the next generation of coders?” Jane Wakefield reports on the move to encourage young children to learn programming/coding. The gives the background to the need to have programming taught at an early age, and also what kinds of tools are available. Programming Power: Does Learning to Code Empower Kids? This post by Ben Williamson looks at the idea that young people should learn to code, which has become a global educational aspiration in the last few years. And asks what kinds of questions should digital media and learning researchers ask about these developments? He suggests three approaches: first, to take a historical look at learning to code; second, to consider it in political and economic context; and third, to understand its cultural dimensions. Why Learning to CodeMakes My Brain Hurt! This post by Mamie Rheingold explains what she believes learners learn when they are programming. Position Statement on learning to program in children’s early years - Dr Andrew Manches writes here providing the rationale for why teaching coding or programming for young children is important. So what tools and resources are available? There is a host of tools available which can be used to support teaching pupils coding or programming. Some are downloadable software, some are specific to certian gaming devices or computing environments. Some work on specific mobile devices as apps. And some are online, requiring no downloads. Chris Betcher describes and illustrates in this video a range of tools suitable for children to learn to code. Code.Org provides a host of resources collated around teaching coding at different stages and ages and for different purposes – but all aimed at encouraging teachers to use coding with pupils. These links include Tutorials for the Classroom: CodeHS (Online curriculum designed specifically for high school classrooms); Codecademy After School (complete online after-school activities for a coding club); Tynker (programming for primary school in a fun way); Bootstrap (high-school algebra and geometry concepts using computer programming); CS Unplugged (Fun classroom exercises to teach computer science principles, with no computers needed). There are links to various schemes to bring enthusiasts into schools as well as platforms aimed at use with children. Nesta Computing Resources for teachers links to resources which support teachers in incorporating coding/programming elements in their learning and teaching. Alice is a tool to enable creating an animated story, an interactive game, or a video to share online. Kodu is a programming tool to create games on the PC and XBox. Logo programming language forms the basis for a number of programmable devices, whether on-screen on robots or vehicles used in schools such as Beebot and Roamer. Click here for resources to support the use of Beebot and Roamer devices or their on-screen equivalents. Zondle Raspberyy Pi Programming Kit is just one of the ways in which Raspberry Pi can be used to help pupils learn programming. Raspberry Pi is a relatively inexpensive palm sized computer which can be used for programming games. 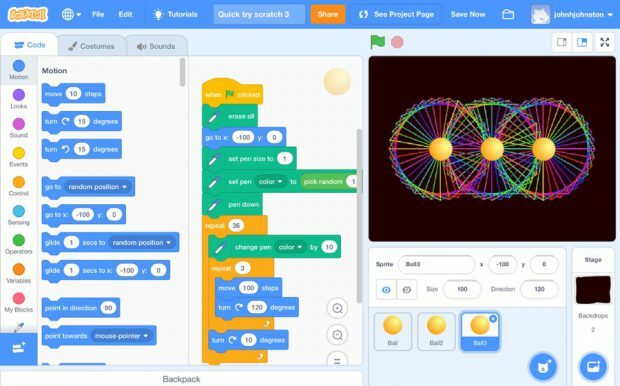 Scratch was previously only available as a downloadable program but is now available as an online version (Scratch 2.0) – this is a programming language that makes it easy to create interactive stories, animations, games, music and art – and share online. Step 1. To get started straight away with pupils go to http://scratch.mit.edu/ and click on the signup button (or sign in if previously signed up). Step 2. Click on “create” at the top http://scratch.mit.edu/projects/editor/?tip_bar=getStarted If this does not show the tutorial step-by-step guide to starting a project then click on “Help” and choose step by step intro here: http://scratch.mit.edu/help/ (this also has printable guides and project cards for use with pupils as well as help videos). Scratch 2.0 Starter Kit - Tools and resources collated by Randy Rodgers to help get teachers get their classes started with Scratch programming. Click here for resources created by Simon Haughton specifically for use in primary school, including instruction cards for pupils to create various games using Scratch (including Pong, Golf and racing cars). Click here for a range of resources from Wes Fryer about using Scratch in school with pupils. This includes video introductions and tutorials, printable guides for pupils and lesson plans and evaluation resources. Click here for Scratch plans for upper primary school age on the Junior Computer Science site. This includes lesson plans and ideas for using Scratch across the curriculum. there are loads of downloadable step by step guides for printing for use with pupils for a host of projects. For those who like to have a paper handheld guide to using Scratch 2.0 (in comic-book style) then there is a book available for purchase reviewed here by Mark Frauenfelder. It’s also available for purchase in digital Kindle format. Coding in the Classroom: 10 Tools Students Can Use to Design Apps and Video Games lists and describes 10 programs available for learning about programming, wther for PCs or mobile devices or other devices. Ask A Teacher: 20 Programming Websites for K-8 - provides a list of 20 programming tools for use in schools with pupils. Includes videos, tutorials and links to resources. On a Mission: How Code Academy is Helping get Programming into the Classroom. Lee Summers describes here how Codecademy for teachers is an online educational site built specifically for teachers. It offers slides for each lesson, as well as a quiz and practice set where students can test their knowledge. The site has been set up so that teachers can craft their own materials and then share them with the rest of the community. @CoderScot - CoderDojo Scotland is part of a global collaboration which provides free coding clubs for young people to learn programming in a fun and sociable environment. This entry was posted in Professional and tagged code, Coding, control, Digital literacy, games based learning, ICT, Mobile Technology, program, programmable, programming, Scratch, scratch 2.0, software, Technologies on 22 November, 2013 by Malcolm Wilson. Here’s an update of how I’ve been using computer games and games programming in my class. In the 2008-2009 session I piloted an S1 enrichment course on games design. Pupils choose in primary seven from three strands: Technologies, Health and Wellbeing or Creative Arts. I got one quarter of the time with the Technologies pupils to show them games design. Anyway, as pilots go, I think it was a success. One of the champions of games based learning (and NWN in particular) is Judy Robertson who had good things to say about the pilot. The pupils that took the course are now in S3 and some are in my Standard Grade classes and have mentioned NWN several times (usually when I’m trying to get them to do boring SQA-related practical tasks). I’m not using NWN at present because the following year the game was installed in a room which was subsequently timetabled away from my use when I had S1. We also had less teachers on rotation meaning longer sessions with pupils, so I diversified my input, looking at games, magazine making, radio stations, videos and photo editing. For gaming I used Scratch and worked on basic movement and graphics skills. This year I’ve not been given any S1 classes on my timetable so no games for them! As a computing teacher, I’m drawn more to Scratch than any other games programming tool out there. It certainly has significant drawbacks in terms of the graphics that can be used (the resolution of the games is maybe 360 pixels squared or something like that) and due to the fact that there’s no way to do 3D games. I like Scratch despite this because the programming interface is so well designed, and, because I’m teaching programming as well as games design, I like how pupils can’t avoid learning logic and structure. The lowest level of detail in scratch is that of each sprite. But text and graphic control and manipulation at that level is similar to the text input and output used in SG and Higher coursework. So the mission with Scratch from here is to develop it as a way to introduce programming, as well as just make games. I’m planning to write units for S3 that show pupils how to use all the concepts they must know for SG Computing in Scratch, and I’m also planning for them to hand in their final coursework programmed in Scratch. I have mentioned this elsewhere and there is discussion of it in our local authority too. While I understand people would have reservations about ‘dumbing down’ programming, I think that’s missing the point. Programming is not an exercise in falling over mistakes in grammar, spelling and syntax, it’s an exercise in logic, problem solving and analysis. I’d like pupils to be able to achieve up to Credit level in Scratch, and then supply a ‘conversion course’ to let pupils learn a language like TrueBASIC. This means the scratch course can be in no way superficial – pupils must understand exactly what they are doing. So the plan for Scratch is to use it from primary 6 to S1. We start wit P6 visits and show them how to control a character. Then P7 visits do some imaginative thinking and design characters which they then control, and for those getting ahead, collect objects for points. In S1 (if it’s available) pupils will learn a set of core game design principles like movement, object collection, points, health, collision detection etc. Then they can chose out of nine game types (platform, top down racing, aiming and shooting, maze etc) to focus on, and could work on three or four over the time they have. In S2 there would be a portion of the year looking at games design. Those pupils that came to us in S1 would be given a mixture of advanced tasks and mentoring work. In S3 the examples from S2 will be used to talk about input, output, structures like loops, arrays and so on. These will be assessed for understanding as concepts (I think this is important if looking at a transition to another language later on) and then used to program coursework. Goodness, that’s a long and not particularly exciting post. But anyway, I wonder if anyone will spot this and if so, if they can give any thoughts on the use of Scratch. I am of course interested in other uses of games, but, that’s probably enough for now for this post, and certainly will be keeping me busy this year writing new stuff for classes! Update: now that I’ve bothered reading online again, I see there’s a Making Games in Schools project on the go, hurrah! This entry was posted in Professional and tagged class work, Development work, Games Design, Scratch, Standard Grade on 20 February, 2010 by geekyteach.